HMH Books for Young Readers, 9780547979175, 48pp. There are planes to fly and buses to catch, but a child uses the power of words, in the form of an invocation, to persuade fate to bring her family a snow day — a day slow and unhurried enough to spend at home together. 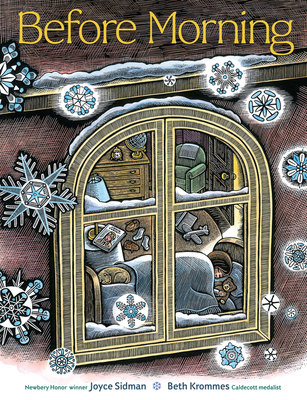 "This is a comforting and deeply satisfying book to read with a child and a celebration of a bit of magic that winter can offer: a gift of time." "It’s a sweet, but never saccharine, tale of family—and so cozy in every possible way that readers will want to return to it again and again. Pair it with your best hot cocoa recipe. Read. Repeat." * "This simply perfect book is a must-have piece of portable poetry and art for all collections." * "[Before Morning's] parallel but separate threads—the innocent images of the poem, the cheery reassurance of the illustrations, and the tension of the family’s wait—give this collaboration significant emotional depth." * "It is rare in picture books to find words and art so perfectly matched, though perhaps not surprising given the talents of Newbery Honor–winning Sidman and Caldecott winner Krommes. Each phrase in Sidman’s spare text evokes the heart and the senses while Krommes’ scratchboard art is so intricately rendered, so full of story, that each page could be investigated dozens of times." * "Like a snow day, a special treat with broad appeal." * "Throughout, Krommes’s illustrations do the narrative work, and a series of wordless spreads at book’s end provides a sweet balance to the front matter’s opening scenes, slowly easing the reader out of this mesmerizing book."